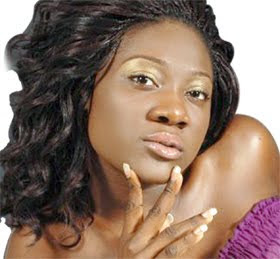 Days after star actress, Mercy Johnson declared her determination to better her crafts and move to greater heights in 2011, her determination is beginning to yield fruits as she was awarded the best actress in the Future Awards 2011 ahead of her two equally respectable actresses, Uche Jombo and Ini Edo. I’m happy I won the award, that means people appreciate what I do, it is good to know that you are loved by a lot of people and for that reason, I am so elated. The Kogi-born actress was also full of thanks to her numerous fans who voted for her she revealed that she couldn’t have won the award without her fans who have always stood by her. The actress however revealed that winning the award does not mean she will be resting on her oars as she disclosed that all she is after for the year is to become the best actress she can be. award further proves MJ as she is fondly called as youths’ favourites in Nigeria and across Africa. Lending credence to this is her recent invitation to Liberia. Mercy will be in Liberia for Valentine concert after the youths of that country voted her as their favourite star. Her acting prowess and large fan base has never been in doubt as the actress has continuously garner fans across board since she got into people’s conscientiousness for her role in the movie, The Maid 2002 though her first movie role was in Moving Train in 2000. Though not personally at the event to receive her award due to busy work schedule in Enugu, a senior colleague, Genevieve Nnaji received the award on her behalf, Genevieve said ‘Mercy deserves the award and more will come her way’. Future Awards is an annual event that seeks to reward young men and women under the age of 31 that have made marks in different facets of life. Mercy Johnson’s Future Awards has added her to the rank of personalities like Chimamanda Adichie, Asa, D’banj and Tuface all who have won the award.